TUBE MAGNUM - represents the series of effects based on the valve signal limitation principle. 12AX7(ECC83) valve used in Tube Magnum circuitry makes it possible to obtain a real valve distortion with a unique warmth and density of tone characteristic to the devices of this series. 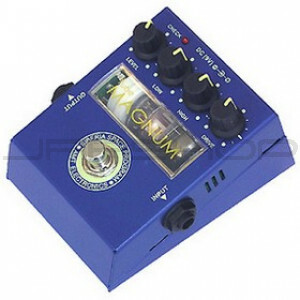 Tube Magnum's frequency-compensated output can be connected not only to a guitar combo but also directly to mixer or a recorder's input. Turn your solid state amp into a Tube Amp powerhouse! FEATURING REAL RUSSIAN MILITARY TUBES NOT THE PHONEY ONES!